Crisp is integrated with Facebook Messenger so you can reply to your Facebook customers directly from Crisp! 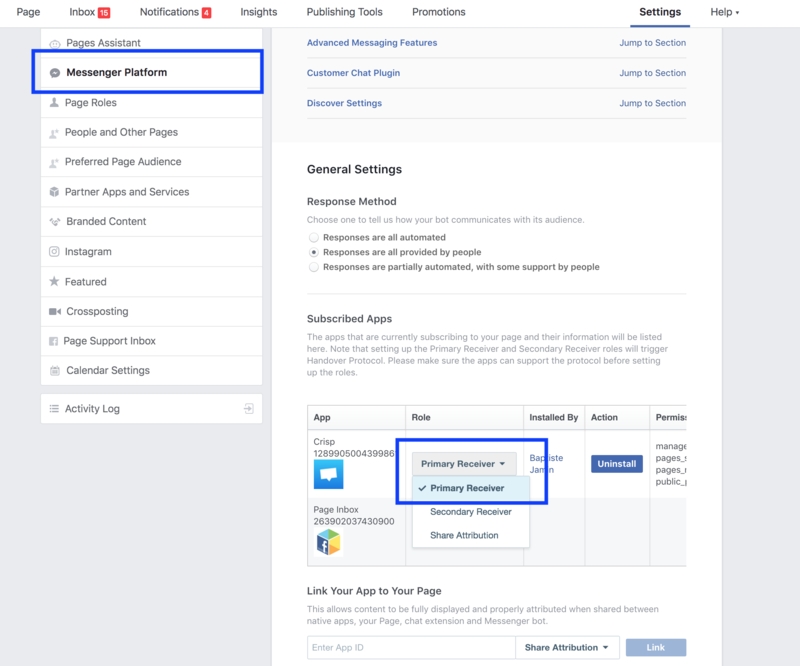 You may use the other Messenger App on your Facebook Page. If you changed your password you need to relink Crisp with Messenger. Follow the step "Link Crisp with Messenger" just above. Let&apos;s say Paul, your developer, links Crisp with your Facebook page. If Paul leaves your company for a new position, you may remove Paul&apos;s admin rights from your Facebook page. In this case, it will break the Crisp <> Messenger connection, as Crisp was using Paul&apos;s tokens. In this case, what you need to do is to relink Crisp with Messenger. Follow the step "Link Crisp with Messenger" just above. Facebook Messenger is currently having a limitation forcing you to reach users less than a 24 hours window. This 24 hours window is a protection from Facebook against unsolicited messages and spam. If a user contacts you, your team will be able to reply in the next 24 hours. If you send a message 25 hours later, your message will be refused by Facebook. If the user sends a new message, you will be able to contact him again.